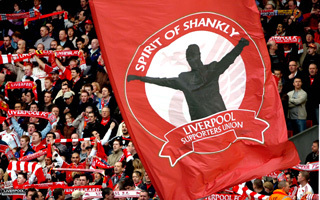 When talks were first being held for the formation of the supporter's union that eventually came to be known as Spirit of Shankly, it was to Karen Gill that they turned. From her, the grand daughter of Bill Shankly, they wanted confirmation that they could refer to the great man in the name of this union that was being set up to help save the club that he himself had transformed in the sixties. When the reply was delivered, it didn't simply contain the confirmation they were looking for but also an inspirational message that gave the Shankly family's wholehearted support to the union. "My grandad had a dream for Liverpool Football Club and you are all helping to keep that dream alive," she wrote. "It's the people with dreams who achieve things in the end because they have a vision which drives them on. We know Bill Shankly 'made the people happy' but I know that you would have all made him happy were he alive to see this legendary support today." As Brian Reade noted in his book an Epic Swindle, "Karen is a marvelous woman who has inherited many of her grandad's traits, not least his fight and his passion." Considering the relationship that Shankly had with the fans, Karen's reaction was always something of a foregone conclusion. "They literally meant everything to him," she says when the question of what the fans meant to her grandfather is put to her. "The club and the fans were his life. No exaggeration." at the terrible damage that Hicks and Gillette did to his beloved club," she continues, looking back at the past three years. Yet it is also reasonable to assume that he, given his Socialist ideology, would have been immensely proud to see the fans working so hard together to get rid of those who were destroying the club. Typically, Karen's favourite memory of here grandfather in a football context includes the fans. "I like all the stories about him taking time out to visit sick children at Alder Hey Children’s Hospital and I’ve had messages from adults who say they remember his kindness to them to this day." At the time, however, she didn't fully realise who he was and why he was so important. "I always knew he was important as from an early age I saw that he was followed around by people wherever we would go. People were always coming up to him and talking football. Journalists were always on the phone to him etc. But it wasn’t until I came to Greece that I realised the extent to which he is admired, literally all over the world." In time, this sparked off her desire to write a book about him with the result being the excellent The Real Bill Shankly that came out a couple of years back. "That was one of the best experiences of my life. I’d wanted to write a book about my granddad for a while but it was when I met the supporters from the official Liverpool Supporters Hellenic Branch that I realised that I should do it. I talked about the idea with Stephen Done (the curator of the Liverpool Museum) and he put me in touch with Ken Rogers from Trinity Mirror and he thought it was a great idea. I just wanted in some way to help keep my granddad’s memory alive"
If that was her aim, then she has done her job to perfection. Just as, with her determination and inspiration at the birth of SOS, she was more than honouring the legacy of her family's surname. Bill Shankly would most certainly have approved. This article was originally published in Issue 8 of Well Red magazine.